There is a story behind this recipe. 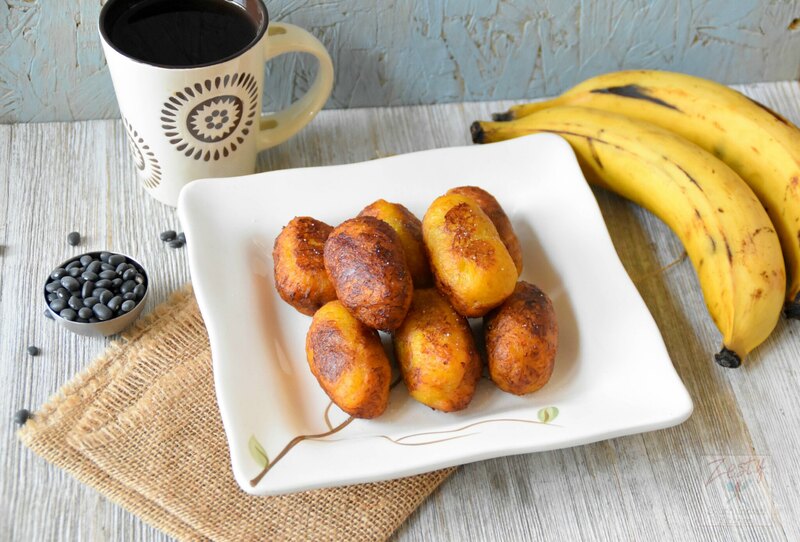 I usually buy plantains from Wal-Mart, if it is not ripe I make banana chips with it, if ripe then I make plantains fritters /pazham poriplantains fritters /pazham pori. When I was checking out, the cashier asked me where I am from. I told him from India, and he further asked what I would do with this plantain? And I replied I make fritters with it. Then he asked how you make it. It told him about batter frying the ripe plantains. Then he told me that they too make plantains fritters which are called Rellenitos stuffed with black beans. You have to try it. I asked him to write it down the name. He even wrote it on a paper that it is Relleniots and also told me to buy canned black beans from the store. After coming back I checked with Mr. Google. I came to know that it is a Guatemalan recipe and that they use refried black beans. Since I bought the canned black beans, I decide to try with it. While checking the videos in the YouTube I came to know that they also add cocoa powder to black beans. I intrigued by this recipe because in my home town Kerala, especially in northern part we have similar dish called unnakaya which stuffed plantains with egg, coconut , cashew nuts and raisins. I never thought a dish from Kerala, India which 16967 km (10542 miles or 9161 nautical miles) to Guatemala looks similar and even cooked in a similar fashion. I also read that Rellenitos are a famous street food in Guatemala. If you want to call them dessert you can. This dish is made with sweet mashed plantains stuffed with a mixture of refried beans, chocolate, and cinnamon. The assembled egg-shaped balls are deep-fried, and then served with either powdered sugar or honey on top. You can make this dish less than 30 minutes. First boil the plantains with cinnamon stick. 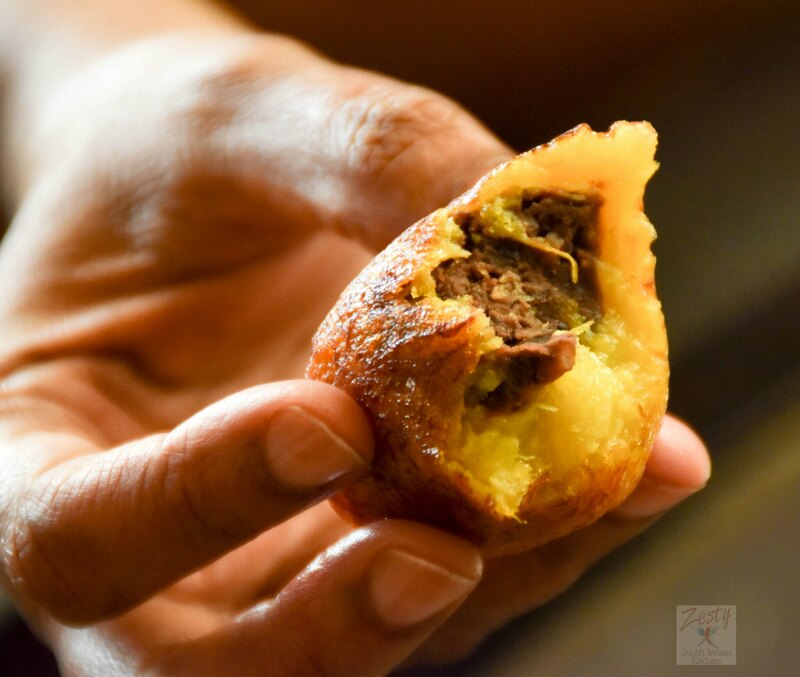 While plantains are boiling make the stuffing, then make the plantain dough and stuff with black bean cocoa powder dough and deep fry. I removed the central black dots from the plantains once it is boiled, you can do it or skip it. I think removing it makes it more pretty. Also make sure to use medium flame other plantains get burned easily. You can roll it in sugar or dust them with sugar once it is fried. I didn’t do it, as I found the sweetness from the plantain itself is enough. If you like plantains then give it a try this easy delicious dish. I have to find that cashier next time and tell him that I made it and it was delicious also thank him for introducing an amazing dish. Delicious plantains stuffed with black beans and cocoa powder which lightly sweetened great dessert from the Guatemala. Cut plantains into 3 inch cubes and boil with 1 cinnamon stick for about 10 minutes. Heat a skillet and add thick puree of black beans, sugar, ¼ teaspoon cinnamon, cocoa powder and heat until everything combines well to form a thick paste and set aside. Once the plantains are cool enough to touch remove the central vein with black spots and mash it into thick paste. Make 9 lemon sized balls from the mashed plantains. Similarly make 9 black bean filling balls which is smaller than the plantain dough balls. 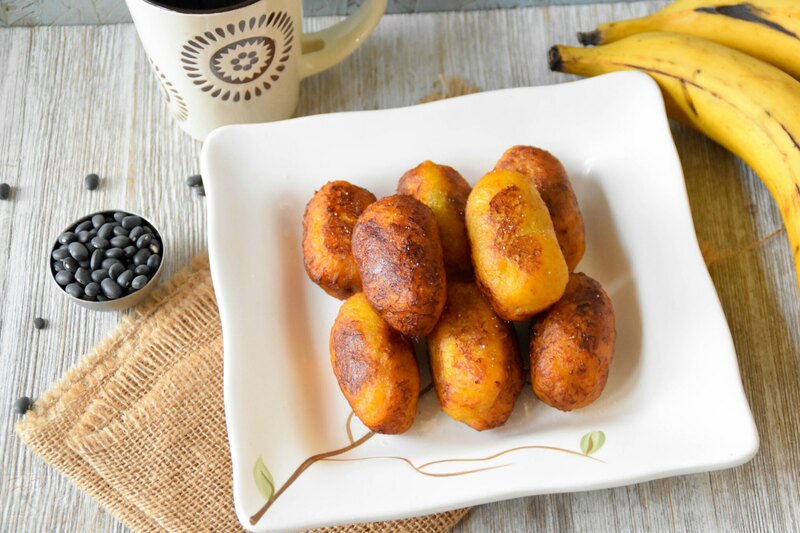 Brush the palm with olive oil press on plantain dough into thick circle and place the black bean filling inside and gradually cover them to form an egg shaped balls and set aside. Heat peanut oil in skillet and then carefully add prepared stuffed plantains and cook until it becomes golden brown color. You need to flip in between to ensure uniform cooking. Once it is cooked remove from the oil and drains excess oil in kitchen tissue and enjoy as such, or dusted with powdered sugar, sugar or honey on top. In pot boil the cut pieces of plantains along with cinnamon stick for about 15 minutes. while plantains boiling make stuffing. Drain the black beans and make puree without adding water. Then transfer the black bean puree into skillet and heat with cocoa powder, cinnamon and sugar. cook until everything mix together and form a thick mass . Once the plantains are boiled remove the skin and center vein . Mash well form a thick dough and divide it into 9 lemon sized balls like this. Also make small balls out of the black bean -cocoa dough. when you are ready to assemble. 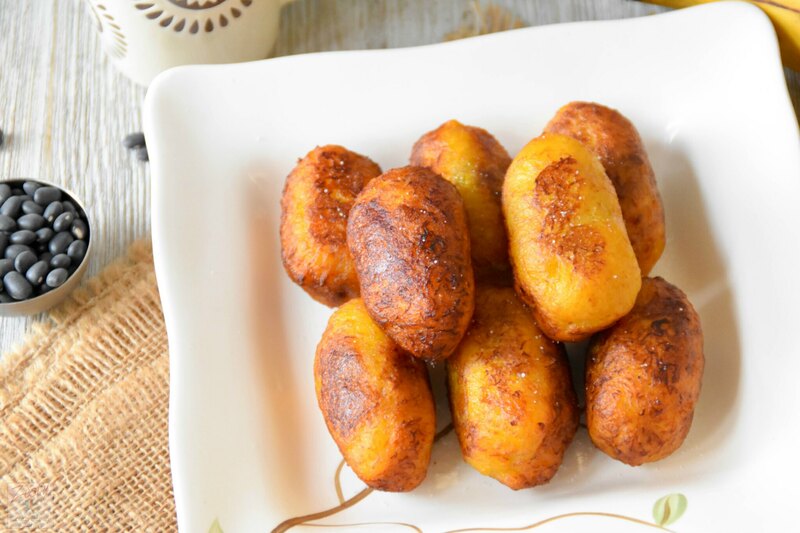 spread your palm or plate with olive oil and spread the plantain balls like this. Then place the black beans filling in the center. Cover gradually like this and form egg shaped balls. Heat oil in skillet in medium flame. when it heated. Place the stuffed plantains carefully in the oil like this make sure not to overcrowd them. When one side is cooked flip the other side and continue to cook until it becomes golden brown. Drain them into a kitchen tissue to remove the excess oil and enjoy with a cup of coffee. Yes this one is delicious give it a try Nalini and let me know. I am fascinated by what I call “food anthropology”; the way similar foods and drinks show up in cultures all over the world or even the words for food and drink that are similar in very distant parts of the world! How wonderful that you were curious and adventurous enough to try out this recipe! The rellenitos look wonderful to me and I would love to try them. Thank you for taking the time to show step-by-step photos. The pictures are so helpful when you are trying something new. I never would have guessed that the peel is left on the plantain when you first cook it! Yes food always amaze me when it show up in the different countries with same cooking method. Glad you liked the post, give it a try it is delicious I assure that. Yes Peel is needed as it give some shape otherwise it will become easily mushy. Who would have thought that a simple conversation at the checkout counter at Walmart could result in this gorgeous recipe? Love it adding it to my bucket list! This is a very interesting recipe. I’ve never heard of it. I once made fried plantains and I didn’t like it, but this recipe makes me curious to maybe try it again. Wow! Those look amazing! I had plantains a while ago, I wish I had done these! I’ll have to go get some! In college I went to the Dominican Republic for a few weeks and I ate tons of plantains! haha they were so delicious! I actually don’t know if I’ve had any since then, though! I love a good recipe with a story behind it like this, Swathi! It’s so lovely when we can share our food traditions with others. Your Plantains Stuffed with Black Beans look amazing. I’ve only tried plantains once but I know I would love this! These look wonderful but most of all I love the story of how you came to make them after that conversation during your shopping! Yummm! These look so good. Shouldn’t be reading recipes when I’m hungry though. I like how you added cocoa with black beans. That just sounds like it would be a good flavor combination. You know the last time I ate plantains was in grade 10 when I went to St. Lucia. So many years ago. These sound incredible. I have seen plantains in the grocery store. Perhaps I will have to give these a try and see if I can come anywhere close to your awesome recipe. We love plantains in the Philippines but have never made anything this way so I am totally delighted to find this. A must-try for sure and that filling sounds divine! Oh. My. Goodness. This recipe is SO perfect! I grew up eating platano (I’m half Nica), so this sounds like a little taste of home! Definitely want to try this recipe out. One of the things I love most about food is how universal it is and how it brings everyone together. I love that you learned about this from a conversation with store clerk! I don’t cook with plantains because I’m not as familiar with how to cook with them (besides fried plantains), but you’ve tempted me with this recipe! Very innovative recipe, looks delicious swathi .. This is really interesting! Just the other day, I was watching a video on Tasty of something similar but with DDL in the center… It is amazing how you get shared a recipe on the counter and how it benefits the food blogger in us, right? 🙂 Lovely recipe…. These sound delicious, although, I have never acquired a taste for plantains. Recently, on a business trip to Florida, we dined at the popular Columbia Restaurant, where plantains were served with everything. It was the first and only time of my life that I enjoyed them, because like these, they were stuffed with something that I’m not sure what it was, but I’m quite positive it was black beans because those are very popular among Cuban cuisine. I love plaintains and don’t purchase them enough. Then when I do, I smash them into circles and fry them up. I’m so happy to have another reason to purchase and make them and I’m loving the black bean puree inside! Oooooh, these sound delicious! We love plantains and black beans – and my toddler does too. Adding these to our “must make” list! I feel like I should have heard of these before and eaten, about a hundred of them. They look and sound absolutely fabulous! It’s amazing how many similar recipes we find all over the world! I don’t think I’ve ever seen plantains in China but if I do I’ll be sure to make this! They look so delicious! These sound like the perfect little snack!! I haven’t tried cooking with plantains before, but I really should, I always love the flavor when I try it out at restaurants. We love plantains and this is such a great recipe to make with it. I recently came across a Japanese bun filled with sweet black beans and I was looking forward to baking it . Now I might try this before as we all love plantains. WoW, these look so pretty and that was quite a conversation at Walmart. I really love hearing about food stories as they not only are delicious but many times we learn that we all have so many similar recipes with a different name. Food really brings people together. These sounds and looks delicious. I never tried plantains before… we don’t have it here in Croatia. But you have me interested in trying this. Maybe I could visit some specialised food store ask about it. Love your food story 🙂 Thanks for the recipe and a good read, Swathi! wow!! lovely share!! Love the stuffing! !